Metal ceramic restorations are still widely used for prosthodontic rehabilitation of compromised teeth and in general are durable and long lasting. However, post-fitting complications in metal-ceramic crowns and fixed partial dentures do occur. One of the most frequently encountered complications in metal-ceramic systems is the fracture of veneering porcelain, becoming a dental emergency, especially when located in the anterior region. Replacing the entire restoration may not be the most practical solution. Intraoral repair of the fractured porcelain offers an easy and cost-effective alternative. The exact protocol for repair varies with the type of fracture that has occurred. This paper provides an overview of various methods of repairing different types of porcelain fractures with an aim to help clinicians manage these dental emergencies in a more effective and conservative manner. The most frequently encountered issue with metal-ceramic restorations is the fracture of veneering porcelain.12 A systematic review13 calculated a 34% frequency of porcelain chipping in metal-ceramic fixed dental prostheses over a period of three years. In contrast, another study reported a mean chipping rate of only 2.9% after a five year observation period,14 whilst a prevalence of chipping of between 5% and 10% over 10 years of use has also been claimed.15 Despite these differences in the reported rates, it can be concluded that porcelain fractures in metal-ceramic restorations are problems which will face most dentists, usually in emergency situations. Composite resins are the recommended materials for repairing porcelain fractures.16,21 The exact protocol for repair, however, varies depending upon the type of fracture that has occurred. This paper aims to provide an overview of various methods of repairing different types of porcelain fractures, albeit possibly in a temporary manner. The knowledge will help clinicians manage such dental emergencies in a more effective and conservative manner. Another classification system was put forward specifically for fractures occurring in metal-ceramic restorations.24 The authors suggested two categories simple fractures that involve only porcelain or complex fractures that result in exposure of metal substrate. Regardless of the type of repair being undertaken, it is recommended that the involved teeth be effectively isolated. The ideal means of achieving field isolation is the use of a rubber dam, either conventional or paint-on, ensuring isolation at the gingival margin. This not only helps control moisture but also protects the hard and soft tissues of the patient from undue damage.25,26 Moisture control is mandatory when procedures involving composite resins are undertaken. Cohesive fracture, occurring within the body of porcelain, can be repaired intraorally by either recementing the broken porcelain fragment with a resin cement or by restoring the broken porcelain with composite resin.12 In both the situations, the restoration substrate first needs to be surface treated, as described below, to facilitate bonding between porcelain and the repair material.32 Despite this enhancement, the bond is not infallible. The fractured porcelain surface is modified and a long bevel is created to facilitate optimal bonding and to achieve esthetically merging margins of porcelain and the repair material.33 If the broken porcelain chip is to be reattached, then that fragment must also be slightly beveled. More recently, lasers have been used as an alternative to HF acid etching and air abrasion to achieve a roughened ceramic surface.47,48 Lasers such as CO2, erbium: yttrium-aluminium-garnet (Er: YAG) and neodymium: yttrium-aluminium-garnet (Nd: YAG) have been used on ceramic surfaces to promote micromechanical adhesion.49 Nd:YAG laser melts the ceramic surface which, upon solidification, results in a surface with blisters.47 CO2 laser, in contrast, results in the formation of conchoidal tears in the ceramic surface that aid in mechanical retention.50 Published literature suggests that Er: YAG laser surface roughening does not yield a durable resin-ceramic bond51,52 and although CO2 and Nd:YAG lasers show better results53,54, the effect is inferior to that achieved with HF acid.55 The generation of heat also contradicts the use of some lasers. Irrespective of the method used for roughening, the surfaces must also be treated with a coupling agent that would promote chemical bonding between ceramic and resin (Table II). Usually silane coupling agents are employed.61 These are bifunctional molecules, one end binding to the silanol group present in the silicate material through a condensation reaction while the other end binds to the resin via an addition polymerization reaction.32 Silane also increases the wettability of the surface, thereby allowing enhanced surface penetration of the resin.62 The most widely used silane is 3-Methacryloxypropyltrimethoxysilane (MPS). Oxide ceramic materials lack the silanol groups and are unable to bond with silane.12 This can be overcome by 'silicatizing' them beforehand. The procedure involved is called tribochemical coating,63 made possible by the development of a chairside system "CoJet silicate-ceramic surface treatment system, 3M ESPE".64 It involves aluminium oxide particles 30 micrometer in size doped with silica. When the surface is bombarded with these particles, it not only helps in roughening the ceramic but also incorporates silica into the ceramic.44, 65 This silicatized ceramic is then able to bond with silane. Another (laboratory) method to condition the surface of zirconia ceramics is selective infiltration etching (SIE).32,70 In SIE, the zirconia surface is covered with a glass-containing conditioner and heated to a temperature above the glass transition temperature of the conditioner. Once cooled to room temperature, the glass is rinsed in an acid bath. The process results in the formation of a new retentive surface, which when combined with a silane coupling agent, yields significant improvement in resin-zirconia bond.71,72 However, studies reporting the clinical efficacy of SIE need to be carried out before any recommendations can be made. Small chipped off parts can be built up using composite resins. Porcelain is first roughened and surface treated. The lost part is restored using a nanohybrid composite restorative material. A layering technique may be used to achieve optimum aesthetics,73 reducing the undesirable effect of the underlying metal shining through.. The third option to repair a cohesive porcelain fracture is to bond a new ceramic veneer on to the existing restoration. To achieve this, the existing restoration will have to be modified. The entire porcelain is removed with the help of rotary instruments and preparation margins are created.74 Impressions are recorded and sent to a laboratory for the fabrication of a porcelain veneer.75 The patient can be provided with temporary restorations until the next appointment. When the final restorations are received, they can be cemented using a resin based adhesive. Cerec (CAD/CAM) system can be used to fabricate porcelain veneers at the chairside by trimming a single block of porcelain. A study on 617 Cerec veneers reported that CAD/Cam veneers fabricated with the Cerec system demonstrated a high survival rate of 94% after nine years and favourable clinical results.76 A number of materials can be used by the Cerec system including VITA Mark II (Vident, Brea, California), ProCad (Ivoclar Vivadent, Inc., Amherst, New York), In-Ceram Alumina and Spinell (VITA Zahnfabrik, Bad Säckingen, Germany). Adhesive failure of porcelain is the failure of the bonding interface. The failure may occur between the veneer layer and the core porcelain, or between the porcelain and the metal substrate resulting in exposure of the underlying metal framework.15 Intraoral repair of such a damage can be quite challenging as it may prove difficult for the clinician to mask the opaque core or framework colour with a ceramic veneer, thereby restricting the aesthetic outcome.12,74 Adhesive failure between core and veneer porcelain is managed in the same way as cohesive porcelain fractures. 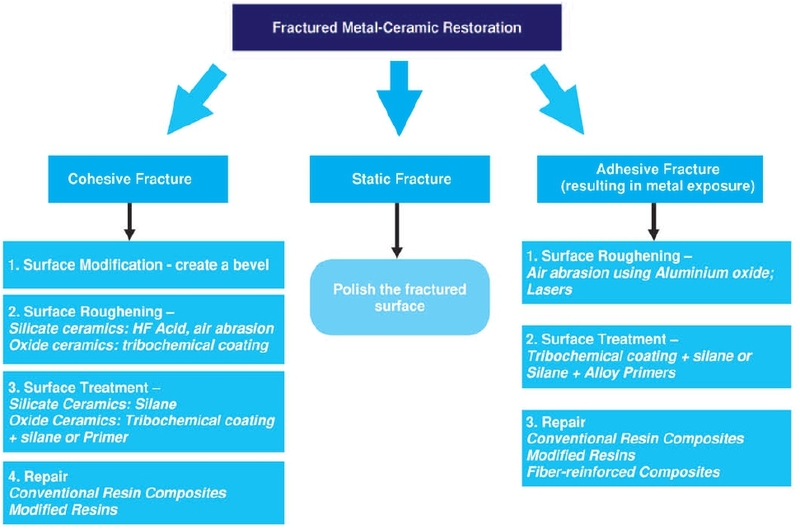 Where the metal substrate is exposed, the repair protocol needs to be slightly modified as described below. A newer method to enhance bonding between metal and resin is silica-lasing. It involves coating the metal with an opaque porcelain slurry and irradiating it with a laser such as Nd:YAG or Er:YAG.48 Madani et al. reported that laser treatment of alloys in conjunction with air-borne particle abrasion yields significantly better bond strengths than laser treatment alone.41 However, silica lasing is a newer method and no appreciable data exists regarding its clinical performance. A laboratory-fabricated composite or ceramic veneer can also be bonded to the facial surface of the damaged prosthesis with the help of a resin based cement.87 This is a more feasible clinical option if complete porcelain delamination occurs. Studies reporting the long-term success of repaired restorations are rather scarce. Özcan and Niedermeier reported an 89% survival rate over a mean period of 36.4 months of metal-ceramic restorations repaired intraorally with composite resins.88 Another study reported a 97.6% survival rate for metal-ceramic restorations repaired with composite after 3.5 years of clinical service.89 There exists a need for more in vivo studies with adequate follow-ups to evaluate the long-term success of such repairs. Fractures involving the veneering porcelain of metal-ceramic restorations are routinely encountered in dental practice. The decision to repair or replace such a restoration revolves around a number of different factors including time and cost. While replacing the failed restoration may be the ideal treatment, it is not always practical. Repair of fractured porcelain should be attempted whenever possible. Repair protocols further vary depending upon the type of porcelain fracture. 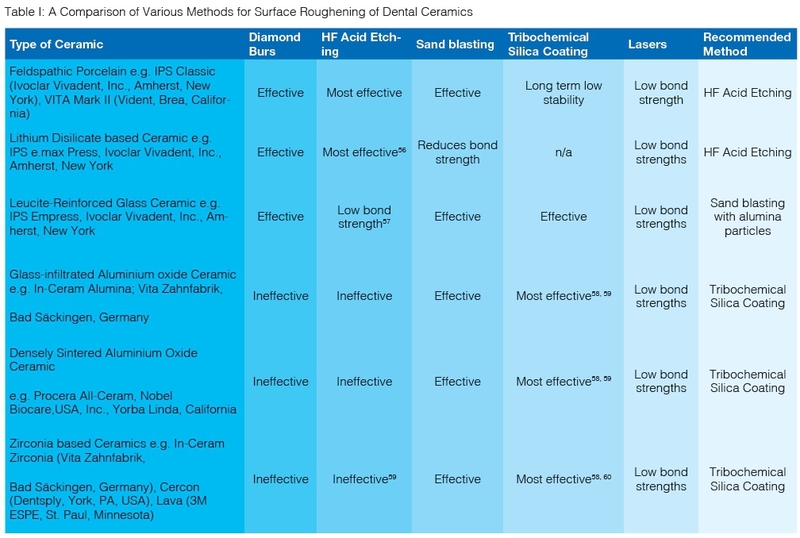 To ensure clinical success and longevity of the restorations, a clinician must be well-versed with the various surface conditioning and surface treatments required to promote bond formation between the resin and the porcelain. This will help in optimizing the performance of metal-ceramic restorations as well as in achieving better patient satisfaction.